"Kaira Looro Competition" is an international architecture competition aimed at raising awareness of the international community towards emerging architecture in developing countries. 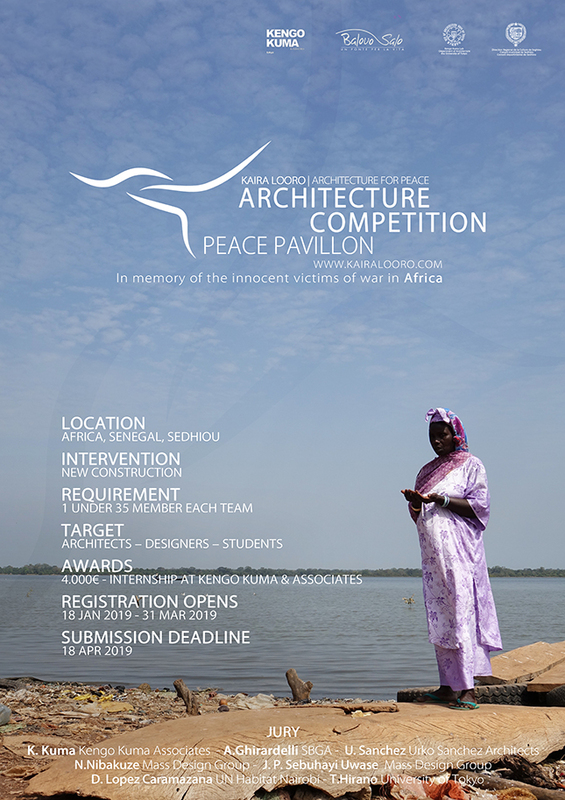 The new edition of the competition has as its theme is to create a pavilion for the promotion of universal peace which inspires contemplation, reflection, and prayer for those who unjustly lost their lives. Commemorating the victims of African wars through the value of peace is a fundamental step in building an inclusive and cohesive society, so that such events may never be repeated in the future. Many African countries have been devastated by internal conflicts stemming from the exploitation of resources as well as from ethnic and religious disputes. One of the continent’s many conflicts took place in the Casamance region, south of Senegal, the area which is the focus of the theme of this competition. Today, thankfully, there is an atmosphere of peace and harmony. (UN Habitat Nairobi), Jean Paul Sebuhayi Uwase & Noella Nibakuze (Mass Design Group), Toshiki Hirano (University of Tokyo). There will be project awarded for the 1st , 2nd and 3rd place, 2 honorable mentions, 5 specials mentions and 20 finalists. The winning project will receive a cash prize and an internship in the Kengo Kuma architectural studio in Tokyo. All awarded projects will be published in the competition’s official book. The competition is open to architects, designers, engineers and students. It’s possible to participate as a team or individually. The only requirement is one under 35 on the team. The objective of this contest is to create a symbolic structure commemorating the victims of the African wars, one that can spread awareness among local and international communities, creating a commemorative and educational space, with respect for the environment and for local traditions. The architecture must be capable of promoting the culture of peace. Contestants will have to convey this theme through a unique and striking design that also integrates itself within the context, creating a structure that is destined to become a symbol of memory for the entire continent, capable of bringing humility and awareness to the landscape, both culturally and thematically. An area of maximum 300 square meters should be envisaged, with areas dedicated to exposure, contemplation and awareness. The winning project will be donated to the Balouo Salo Non-Profit Organisation, which will share it with consultants from the sector, with the communities, and with Sedhiou’s institutions in an effort to evaluate the feasibility of its realisation. The competition is organised in order to contribute financially to the humanitarian activities of the Balouo Salo organisation. All proceeds from the competition will be donated to said organisation. All awarded teams will be presented with an official certificate from the competition. All awarded projects will be published in the competition’s official book and on its website, transmitted to architectural websites and other architectural contexts, and displayed at architectural events. The projects may also be published in national and international architecture magazines. N.B. The methods in which the awards will be distributed are specified in the conditions. To enter the contest, participants have just to fill out the registration form in the official website.